In 1915 Britain's War Office, which had initially opposed recruitment of West Indian troops, agreed to accept volunteers from the West Indies. 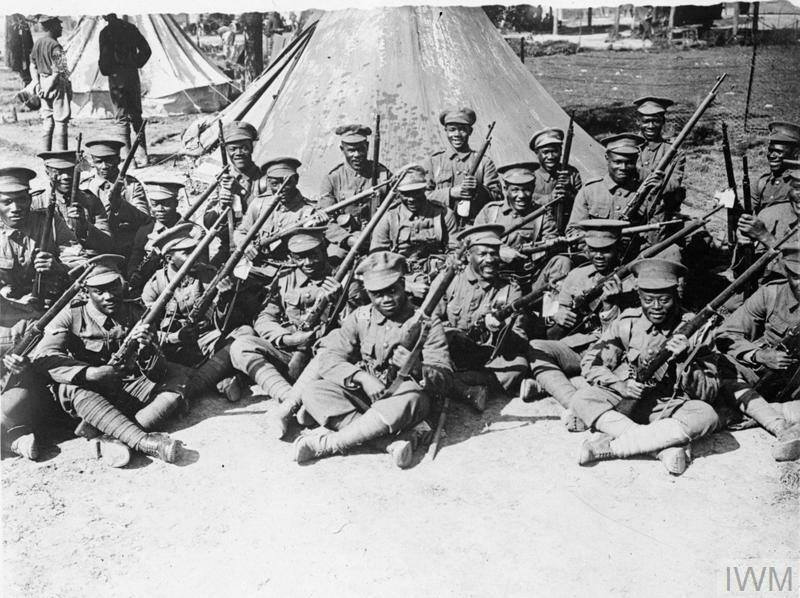 A new regiment was formed, the British West Indies Regiment (BWIR), which served in Europe, the Middle East and Africa. Some of the items below are on display in our First World War Galleries. You can use this article to guide you to their location in the galleries. We have also included additional information that sheds light on the story of the West Indies' contribution to the war effort. You can see this photograph in the 'Total War' area of our First World War Galleries. The formation of the BWIR did not give soldiers from the West Indies the opportunity to fight as equals alongside white soldiers. Instead, the War Office largely limited their participation to 'labour' duties. 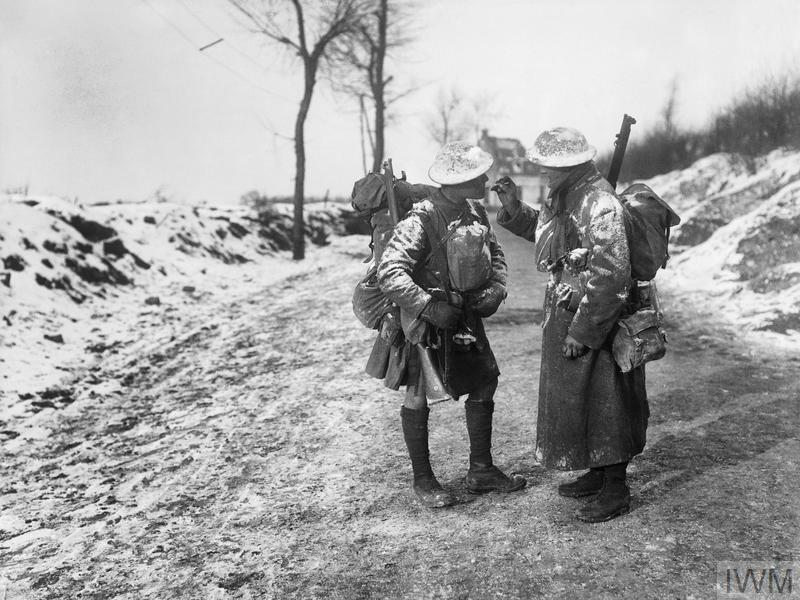 The use of BWIR soldiers in supporting roles intensified during the Battle of the Somme as casualties among fighting troops meant that reinforcements were needed in the front line. Troops of the West Indies Regiment in camp on the Albert - Amiens road, September 1916. BWIR troops were engaged in numerous support roles on the Western Front, including digging trenches, building roads and gun emplacements, acting as stretcher bearers, loading ships and trains, and working in ammunition dumps. This work was often carried out within range of German artillery and snipers. In July 1917, 13 men from the BWIR were killed by shell fire and aerial bombardment. 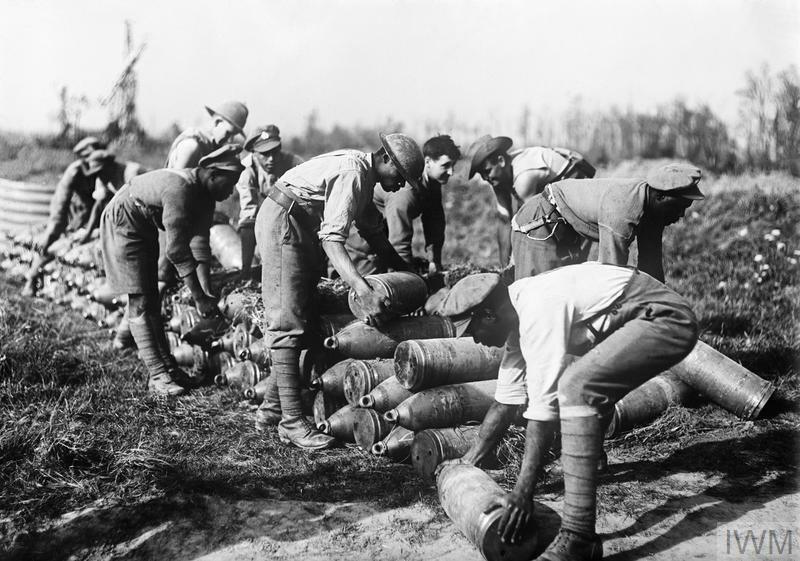 West Indian troops stacking shells at Ypres, October 1917. In 1917 Field Marshal Sir Douglas Haig said of the BWIR, '[Their] work has been very arduous and has been carried out almost continuously under shell-fire. In spite of casualties the men have always shown themselves willing and cheerful workers, and the assistance they have rendered has been much appreciated by the units to which they have been attached and for whom they have been working. The physique of the men is exceptional, their discipline excellent and their morale high'. Several battalions of the BWIR were deployed to Egypt and Palestine. Here too, they were mostly used in support functions, such as guarding prisoners and holding reserve posts and outposts, although in 1916 the War Office relaxed its opposition to the BWIR being used in combat. Men of the BWIR creating dugouts in Palestine. You can see this sign in the 'Breaking Down' area of our First World War Galleries. First World War sign pointing to Jerusalem. This sign points to a famous British victory, the capture of Jerusalem in 1917. Yet this was not the end of the struggle for Palestine. Soldiers of the BWIR arrived in September 1918 and played their part in the fighting which would secure victory the following month. In one action, the 2nd Battalion BWIR was given orders to clear enemy posts close to the British line in Palestine. This involved advancing across over 5km of open land under heavy fire. The objective was achieved with nine men killed and 43 wounded. Two men, Lance Corporal Sampson and Private Spence, were awarded the Military Medal for bravery during the action. On 20 September, after the campaign, the commanding officer of the BWIR, Major General Sir Edward Chaytor, wrote, 'Outside my own division there are no troops I would sooner have with me than the BWIs who have won the highest opinions of all who have been with them during our operations here'. The 2nd Battalion, West India Regiment embarking for active service in East Africa. Photo courtesy Australian War Memorial. In addition to the BWIR, the West Indies contributed men through the West India Regiment (WIR), which consisted mainly of black African soldiers. The WIR had existed since 1795 and served Britain until 1927, when it was disbanded for economic reasons. During the First World War, the regiment was deployed in East Africa as well as Togoland and Cameroon. Togoland (which now forms modern day Togo and part of Ghana) and Cameroon were German colonies with important wireless stations. The first two years of the war saw a multi-national force - including West Indians, Nigerians, Ghanians (Gold Coast) and Indians - capture Togoland and Cameroon from Germany. In July 1916, 500 men of the BWIR were also sent to fight in German East Africa. There they were engaged in guarding the railway line captured from German forces, manning communications posts, and finding and capturing German ammunition dumps. This was a difficult and little-remembered posting. The rainy season brought challenging conditions, and soldiers suffered from malaria, exposure and lack of supplies including clothing and food. Letters were rarely delivered due to the remote location. Cigarette cases such as this one were presented to all ranks of the British West Indies Regiment for Christmas in 1917. While gifts such as these were always welcome, they were scant consolation for what many BWIR men experienced. Poor accommodation in training camps in England resulted in men of the BWIR developing frostbite and pneumonia. Cigarette case presented to all ranks of the British West Indies Regiment, Christmas 1917. In March 1916, a ship transporting BWIR men from Jamaica, the SS Verdala, was diverted into a blizzard near Halifax, Canada, to avoid any lurking German warships. As a result of inadequate equipment, over 600 men suffered from exposure and frostbite, 106 men required amputations and at least five men died. West Indian troops also often had to deal with racial discrimination from their fellow soldiers and the military authorities. In 1918 BWIR soldiers were denied a pay rise given to other British troops on the basis that they had been classified as 'natives'. The increase was eventually granted following protests by serving soldiers and the various island governments. Tensions brought about by this sort of treatment eventually came to a head in Taranto, Italy in December 1918. Frustrated by their continued use as labourers whilst waiting for demobilisation, men of the 9th Battalion attacked their officers in a mutiny that lasted four days before being quelled. A BWIR soldier, thought to be Lance Corporal Leekam, receiving the Military Medal in 1917. Photo courtesy Library of Congress. A number of BWIR soldiers were awarded gallantry medals during the war, including five Distinguished Service Orders, nineteen Military Crosses, eleven Military Crosses with Bar, eighteen Distinguished Conduct Medals, as well as 49 Mentions in Despatches. Among other soldiers from the West Indies who were awarded decorations was future Premier of Jamaica, Norman Manley, who received the Military Medal. You can see this painting in the ‘War without End’ area of our First World War Galleries. By the end of the First World War, 185 men from the BWIR had been killed in action and 1,071 had died of sickness. The Commonwealth War Graves Commission tends the graves of BWIR men in cemeteries in Britain, the West Indies, Belgium, Egypt, France, Italy, Iraq, Israel and Palestine, and Tanzania. Many of the West Indian men who returned from fighting in the 'Great War' came home with a sense of grievance. They had answered Britain’s call. They had fought in a war that was not of their own making yet played their part in the eventual defeat of Germany and its allies. But they had still faced discrimination for their colour. 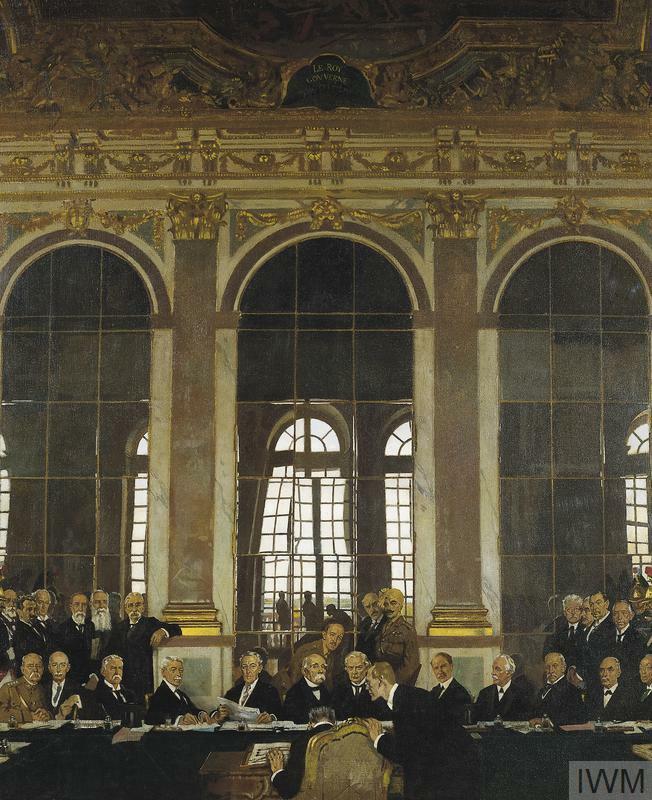 The signing of the Treaty of Versailles was meant to create not just a peaceful world but a fairer one as well. Yet this vision would not include self-determination for many of the subject peoples of Britain’s non-white colonies. In supporting the war effort many West Indians had hoped for change, but it would take several decades, and another world war, for the islands to gain independence from Britain. We would like to thank Arthur Torrington CBE, Projects Director of the Windrush Foundation, for his assistance in producing this article. When war broke out in 1914, the British colonies in the West Indies quickly pledged their support to Britain in men, money and materials. King George V called for 'men of every class, creed and colour' to join the fight against Germany. Soldiers from the Empire and Commonwealth made a significant contribution to the Somme offensive. On 1 July 1916 a battalion from Newfoundland, attacked with the 29th Division, while the 1st Battalion, The Lincolnshire Regiment included a contingent from the Bermuda Volunteer Rifle Corps.